Mayer, who did such a brilliant job with “Spring Awakening,” has collaborated on the book with lyricist Billie Joe Armstrong, and the result is something of an amalgam of “Tommy,” “Passing Strange,” “Hair,” “Rent” and yes, “Spring Awakening” in its themes of coming of age, alienated youth, and social change. The original CD has apparently been augmented by songs from Green Day’s “21st Century Breakdown” album. 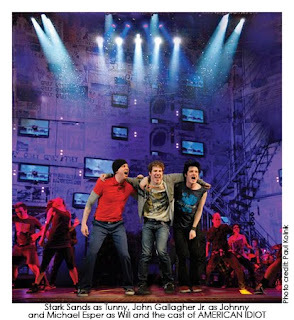 Set in the recent past, during the Bush administration, the narrative charts the fortunes of small-town friends John (John Gallagher Jr.), who calls himself the “Jesus of Suburbia,” Will (Michael Esper), and Tunny (Stark Sands). John falls in love with a gal called Whatsername (Rebecca Naomi Jones), but their relationship is jeopardized by drug dealer St. Jimmy (Tony Vincent). Will learns he’s fathered a child with his girlfriend Heather (Mary Faber), but ends up alienating her. And Tunny, recruited by a military hero (Joshua Henry), goes to war, loses his leg and is tended by a sympathetic nurse (Christine Sajous). John returns home at the end, having learned the error of his ways. First staged at Berkeley Repertory Theatre in September, the production looks absolutely spectacular with Christine Jones’ floor to ceiling mosaic, studded with video monitors (Darrel Maloney is credited with the video/projection design). Brian Ronan’s sound is state-of-the-art, but it is quite loud (some may wish to bring earplugs), and many of the lyrics of the heavy rock numbers are unintelligible. But there are some lovely lyrical moments such as “Boulevard of Broken Dreams” and “We’re Coming Home Again” sung by the three men towards the end, and music director Carmel Dean provides top-notch accompaniment (the musicians positioned around the stage) playing Tom (“Next to Normal” Kitt’s savvy expanded arrangements. 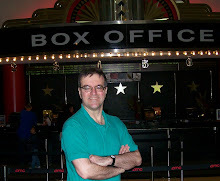 Mayer elicits strong performances from his leads, matched by the superb choreography and movement by Steven Haggett. A mid-air pas de deux for Sands and Sajous emanating from a hospital scene is simply breathtaking. I honestly can’t say the theme of youthful angst particularly resonated with me, nor is the dramatic arc per se as absorbing as some of the aforementioned rock operas, but the committed performances, frequently striking score, and riveting stagecraft make this show essential viewing.